Happy New Year! Ok, so I realize it’s January 1st and I’m still posting Christmas projects but these could technically work for winter so I’m going with it. The reality is, I couldn’t post these easy little Handmade Ornaments until after Christmas because I didn’t want to ruin the surprise for my family so I am finally getting around to sharing them! Almost every Christmas throughout my childhood I made a homemade gift for my grandparents and extended family. Some years I would even start making gifts in the summer time because I was so excited. I think I stopped sometime in Middle School (maybe even high school) and I have since restarted the tradition with my own kiddos. 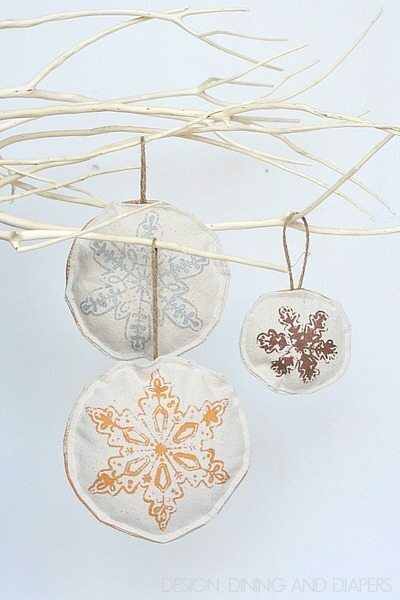 This year, Miss E and I made these little Painted Drop Cloth Ornaments. One side she painted with a snowflake stencil and the other side I let her freehand. 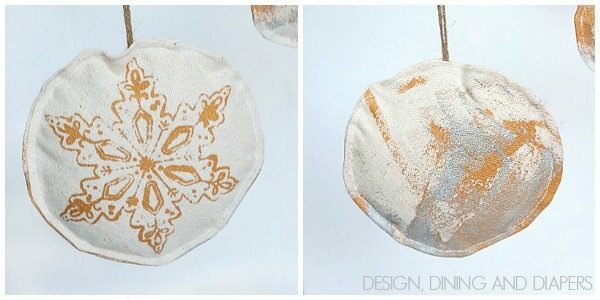 I had to jump in and help with the actual construction, but otherwise these are really fun Handmade Ornaments For Toddlers as they really showcase their true artwork! 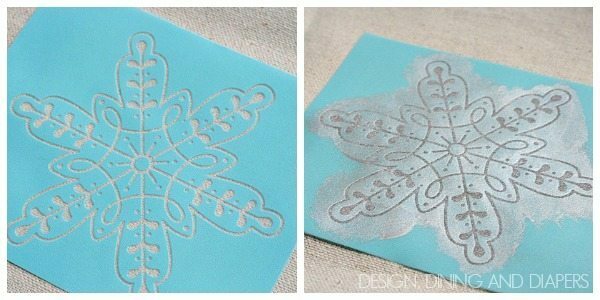 First we stenciled different sizes of snowflakes onto the drop cloth, using different metallic colors. 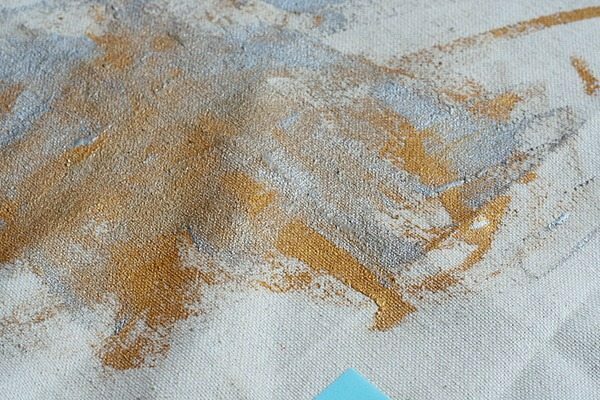 I love love these Lumiere paints from Jacquard products because they are actually really soft and I’ve even washed them before and they don’t crack or fade. I cut the snowflakes out into circles, as well as the paintings. 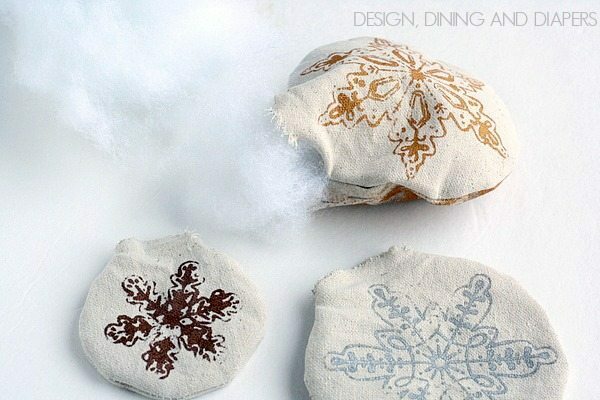 Making sure that one snowflake and one painted piece match in size. Then, put the right-sides facing together and pinned them. I stitched around the outside, leaving a small section open. I flipped the circles open so the right-sides were out, and then stuffed them with pillow stuffing. 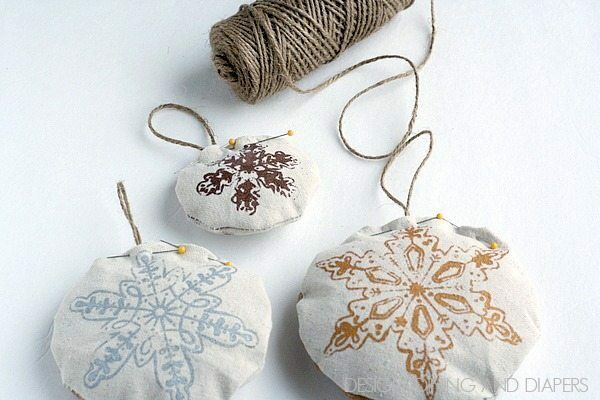 When my mother-in-law opened hers, she actually thought it was a sachet and I thought that was a great idea (although these are just ornaments) all you would have to do is fill them with potpourri or lavender and these would work great for that as well! Haha you are so cute! 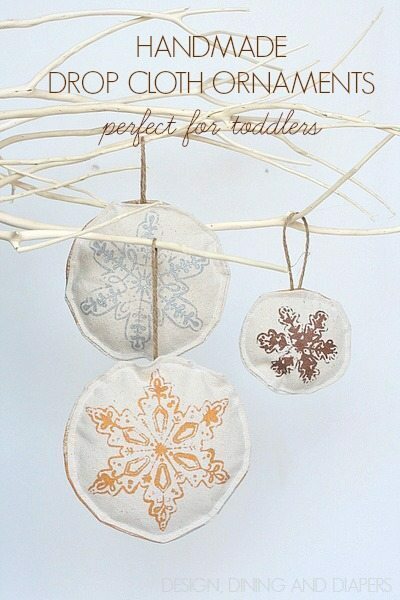 Just popped over from your FB post “Okay, don’t laugh…” Love these cute “wintery/Christmas” ornaments! 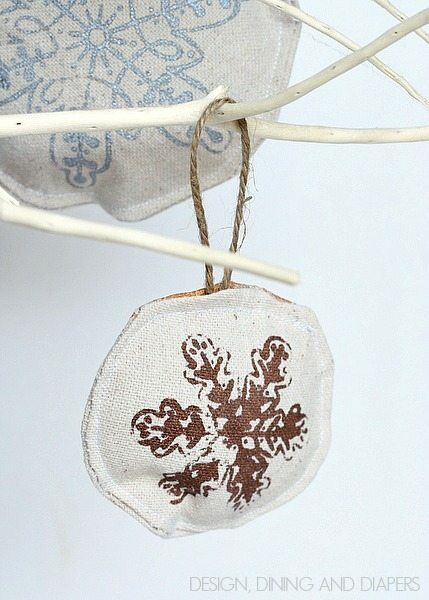 Love these ornaments, they could be made into other seasonal ornaments as well as sachets. Love this, you are so smart. Great idea to have your little one help also. Never too soon to learn, think she’ll follow in her Mom’s footsteps. I just keep thinking of ways to embellish these or do as you have. Hope you had a great New Years. Give both little ones a hug/smooch for me ok? Wow. 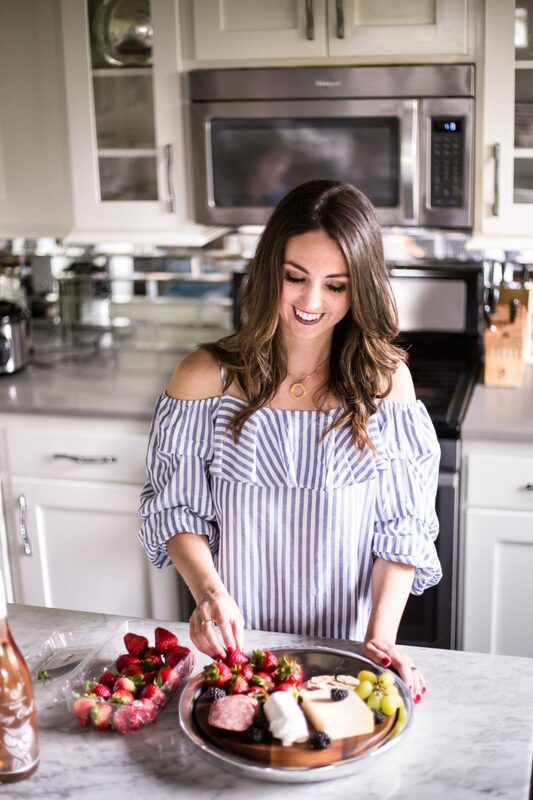 These are simply stunning! I love the colors you used, as well. 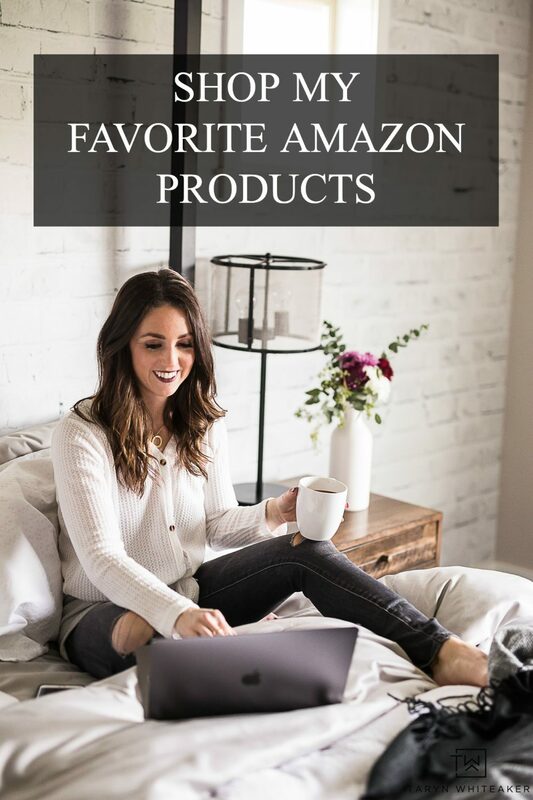 I’d love for you to stop by our link party and share with everyone!